An ad disruption by Poster Boy. Photo by Poster Boy. But it is impossible to talk about contemporary ad takeovers without mentioning Poster Boy. Poster Boy is an anonymous collective of artists/vandals/activists who disrupt advertising. Their most famous works involve using a razor blade to cut up and recombine advertisements on New York City subway station platforms until they have new and twisted messages. 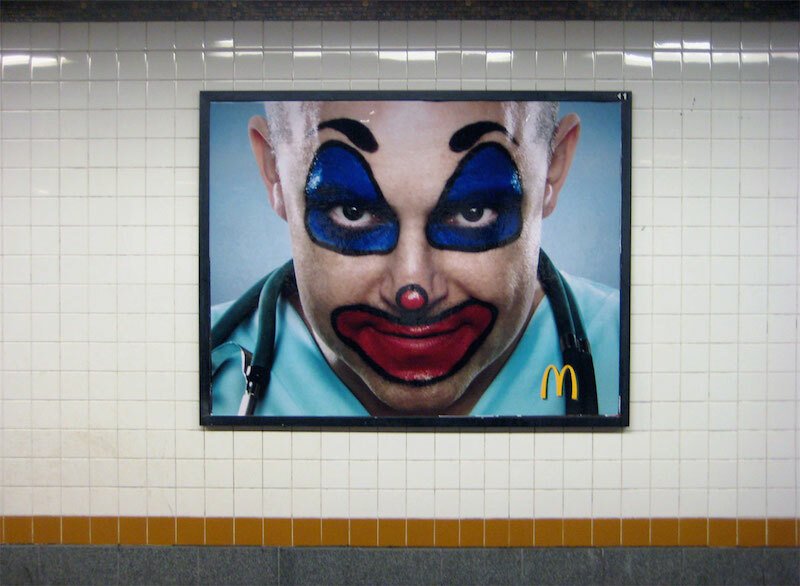 For example, there was the ad for the television show Children’s Hospital with a scary looking clown wearing a doctor’s scrubs to which Poster Boy added a small McDonald’s logo. Because their work does not last long, documentation and online distribution is essential to its effectiveness, something Poster Boy readily acknowledges. I can say quite confidently that I would not have heard of Poster Boy or seen their work without the internet, and many blogs have become enamored with their work, launching it into the public spotlight. There are certainly many street artists and graffiti writers who are more prolific, but few have caught the Bored at Work Network’s imagination like Poster Boy. RJ: How do you think Flickr, other photo sites and blogs have affected graffiti and street art? Poster Boy: Social media has opened new doors for graf and street art, but accessibility is a two-way street because Big Brother also reads the blogs. RJ: Why do you have a Flickr, and how do you use it? Poster Boy: Flickr is the new writer’s bench. We use it to communicate our ideas with people who might not have the chance to experience it otherwise. The social media sites have become just as important as the work itself. Poster Boy: We’ve always maintained that Poster Boy is about manipulation of media. Generating publicity IS the project. Sometimes the physical work is secondary. RJ: Have you found the internet to be helpful, harmful or neither when it comes to promoting your projects? Poster Boy: The internet is an unpredictable beast, but if you’re quick you can tame it. RJ: When did Poster Boy begin? Poster Boy: When the blogs started writing about it. Poster Boy: I’d say 20% of it is experienced in person, because the physical work never lasts long. However, the opposite happens online. All you need is one piece to ignite a wildfire. Sorta gives new meaning to the word tagging. Poster Boy: We kinda already do. RJ: Why do you cover billboards? Poster Boy: Because deep down inside everyone wants to do it. RJ: How long do your pieces usually last on the street? Poster Boy: Depends on how clean the piece is. Usually not very long at all. RJ: Why do you photograph your work and post it online? Poster Boy: Even though we come off as very anti-everything the urge to communicate is too great. Poster Boy always has ulterior motives which are hinted at with the political undertones of the work. RJ: How much of your work ends up documented, and how much of that documentation ends up online? Poster Boy: It’s too difficult to determine because some of us document the before and after, while others leave documentation to commuters. RJ: Do you think it is particularly important for people who take over billboards to document their work? Poster Boy: Yes, because billboard pieces are specifically political which means they’ll get buffed quicker. It’s important that we not feel alone in our struggle with consumerism. Poster Boy: Even Martha Cooper‘s photos don’t smell like paint.